This App emulates the behavior of Android Wear Watches when receive notifications. and the others you want. First of all, enable this App to be able to listen to your notifications. After that run the App on your gear S.
WARNING: It takes some seconds to connect first time. If doesn't work (The top-left button background is red) tap on red Button and press connect button or disable bluetooth in your mobile phone and enable it again. - Swipe LEFT to go to left but if it is the first page, the notification will be erased and in your mobile as well. In some notifications you will see images like whatsapp if the notification image is shown in your mobile too. In some notifications there are actions, you have to tap on it to execute it. If the action has options to answer from the watch, the circle background will be Red instead of Blue and when you tap on it a list of answers will be showed. Tap on any of them to answer the notification. Now with voice input reply. Now with options menu. Tap on top-left button to go. Tested on WhatsApp, Hangouts and Gmail, but it should work in other Apps as well. You select the Apps that you want to receive Notifications or not. You can use this system and the default notification system as well. Select only the Instant Alerts checked in the default system and use this App for the rest notifications. Go to the mobile App to select more settings. You can enable or disable receiving notifications in the App settings or sending Broadcast intents from another App like llama or tasker. Now in spanish language as well. This App is similar to this one http://forums.androidcentral.com/sam...-gear-2-a.html but for Gear S instead of Gear 2. It can be found on Samsung Gear Store. Ntchwaidumela and Raj3215 like this. I can't find this anywhere. Tried Samsung Gear Apps Store and Google Play? Is this the same app as "Notifications for Gear S"? No, this is another version with its own interface. I like it more, but it depends on you! Version 1.9.0 uploaded to certification process with some changes. Compatible with clock with notifications like the new ClockGearS App. Soon at Samsung Market for free. Does this app work RELIABLY to receive notifications on my Gear S when it's not connected by bluetooth to my Note 3? Yes, but only will receive notifications without reply options. 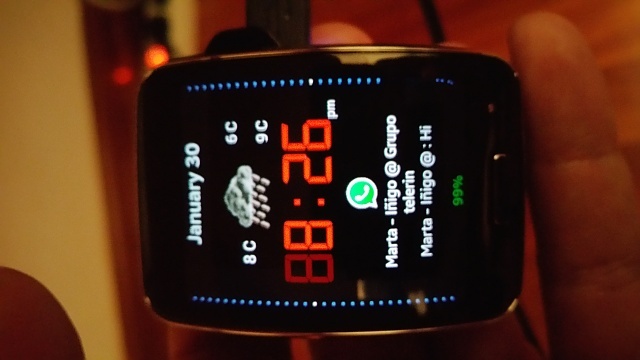 The user must have the App "Notifications Wear Style for Gear S" installed. At Settings he have to set your WatchFace id. Image attached. It's useful that switching on screen option at settings is disabled in order not to get conflicts. Your watchface will switch on the screen and vibrate the gear. In order to launch the App Notifications Wear Style when the user Tap on message. 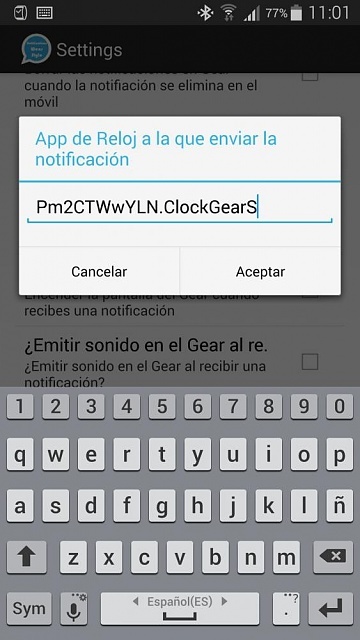 Clock for Gear S with Notfications ready for download at Gear Store. Downloaded it and it seems to work really good. Took me a while to get it working you have to download notification ware for it to work. Video is terrible. Where can we find the software? In Gear app store i cannot find it.